The San Angelo Chapter is always accepting of new members to help us with our cause. You membership fees will help to preserve hunting and wildlife around the world, as well as your local community. - Become a member of the main SCI out of Tucson Arizona. They have several options including yearly, 3 year, and life. 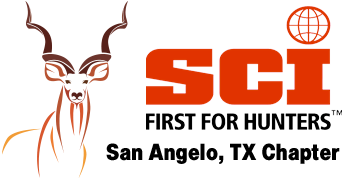 - All SCI members are eligible to join our Chapter. We offer yearly and lifetime memberships. ****You must be a lifetime member of SCI to become a Lifetime of the Chapter. You can sign up online at SafariClub.org or Can call 888-486-8724. Make sure you mention you would also like to Join the San Angelo Chapter.